Nova Electric released its new NGLRK series of 3 phase high power pure sinewave rack mounted inverters capable to deliver up to 7.2 kW / 9 kVA. Standard outputs offered for this unit are 115/200 VAC, 120/208 VAC, 220/380 VAC, 230/400 VAC or 240/415 VAC and frequencies of 50, 60 or 400 Hz. The units in this series accept 24 VDC, 36 VDC, 48 VDC, 72 VDC, 120 VDC and 270 VDC. The output THD distortion is 3% maximum, but typically 2%. This unit can supply high peak current to loads with high inrush current at turn-on. The unit features OV, OT and OL protection. The series contains EMI filtering but for MIL-STD-461 compliance, an external filter will be needed. Such filter is available optionally. 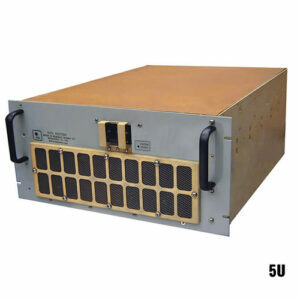 The unit construction can be ruggedized optionally to meet the requirements of MIL-STD-810 for ground vehicle, below deck shipboard or inhabited airplane. The size of this unit is 5U (8.75” x 19” x 24”) and it weighs 60 lb. Lower power units are available in sizes ranging from 1 U to 3 U tall. Cooling is done by internal fans with washable air filter. Connector mates and chassis slides are offered. Delivery is 6-8 weeks. For the online catalog please follow this link. For further information please fill the form below or call Mr. Howard Schrier at Nova Electric at (201) 385-0500 ext. 128.